Residence Andorra Peretol Sunari is located in Bordes d'Envalira, in the Peretol district, 2.5 km from the center of Soldeu and the gondola connecting to Grandvalira ski area. Apartments are comfortable, spacious and offer a magnificent view on the mountain. The residence has 4 floors with a lift and offers well-equipped accommodation. 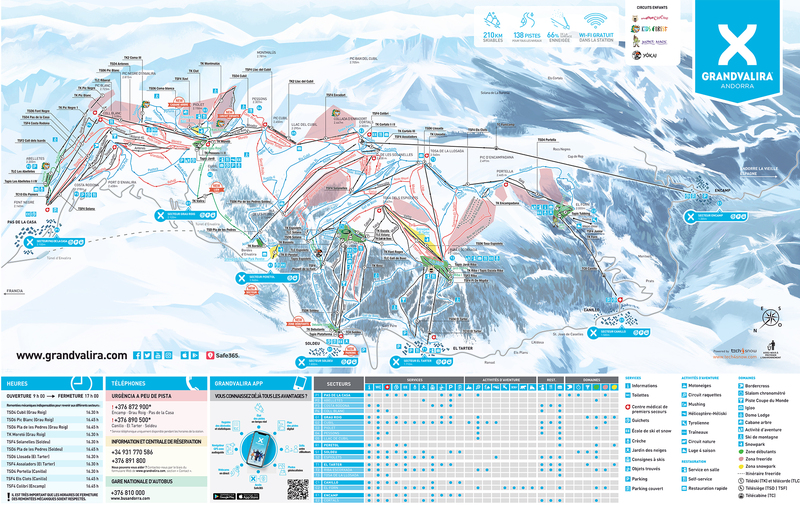 To collect the keys, please go to residence Pierre & Vacances Andorra Bordes d'Envalira located at 500 m from the residence. Distance to the nearest shops: in Soldeu at 2,5 km (supermarket, bars, restaurants, ski shops) or in Canillo at 7 km. In Andorra, in Grandvalira ski area, in the heart of the Pyrenees, Residence Andorra Bordes d'Envalira is just located in the hamlet of Bordes d'Envalira 2.5 km from the cable car conecting Soldeu to Grandvalira ski area. Accommodations are in 3 buildings, from 4 to 7 floors, with lift. All accommodation are well equipped, fully new interior, for a better comfort during the holiday. The nearest shops are in Soldeu 2.5 km (supermarket, bars, restaurants, ski shop) or in Canillo (7 km). Located in the heart of the Pyrenees, Residence Pas de la Casa Princesa is located in the charming village of Pas de la Casa, at 2000 meters altitude. The residence has 70 apartments in 4 small buildings of 6 floors with elevator. Modern and spacious apartments that benefit from new interior equipment. The residence is located 200 m from the ski lifts and close to the largest ski resort in southern Europe, Grandvalira (210 km of slopes, 3 snow parks and freestyle school). Like other cities in Andorra, Pas de la Casa is famous for the shopping. Also you will have access to many shops for sport, perfumes, jewelry... Quick access to the slopes from this residence. In the charming village of El Tarter, at 1700 m, Residence Andorra El Tarter has 50 apartments in several small buildings of 3 floors (with elevator) with beautiful views of the valley. It is situated at 400 m from the pistes and the cable car connecting El Tarter to Grandvalira ski area. Apartments are spacious and modern with a new interior equipment. A supermarket is at 500 m from the residence, and near the village you can find bars, restaurants, ski shop. In the charming village of El Tarter in Andorra (1700 m), El Tarter Alba Residence is composed of studios and apartments with superb views of the valley. The residence is about 400 m from the ski slopes and the cable car connecting El Tarter to Grandvalira ski area. The accommodations are comfortable and well equiped. Convered car parking is available (extra fee).